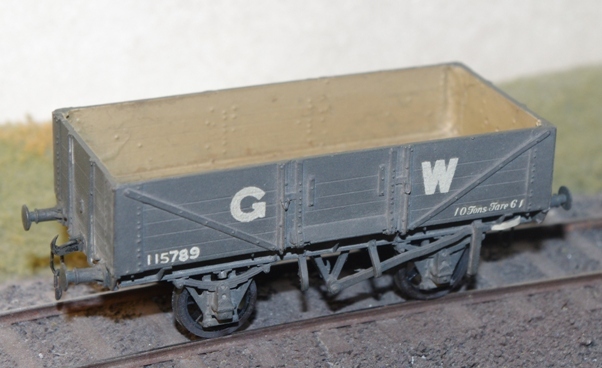 The GWR built many different designs of 16' and 17'6" Open Goods wagon. These are a couple that I have modelled. 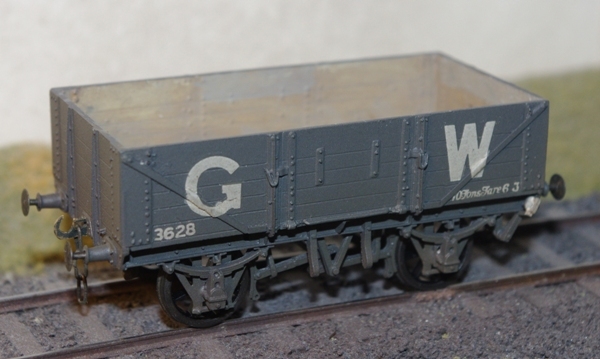 This model of a 16' long, 5 plank open was built from a Coopercraft kit to represent an O4. The O4 design was similar to earlier designs except it had the new DCI type of brake gear which first appeared in 1903. 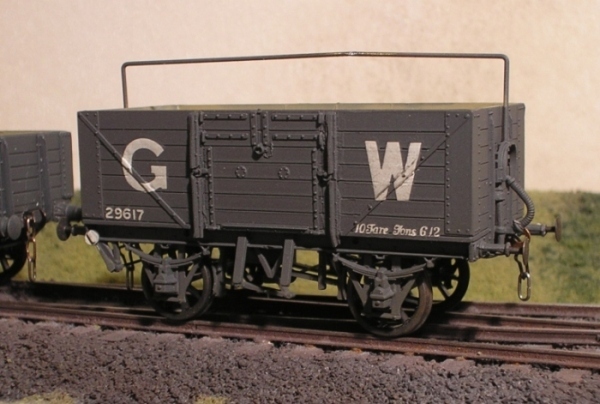 This model of a 16', 7 plank open was converted from a Coopercraft kit to represent an O10. It had DCII vacuum brakes, a sheet supporter and 2 plank cupboard doors above a 5 plank drop door. This is a model of an O11 5 plank open built from an ABS kit. 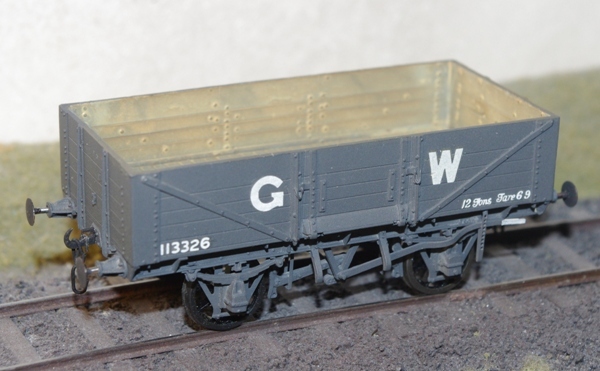 It has DC III brake gear, a sheet supporter and GW self contained buffers. An O14 from an ABS kit. 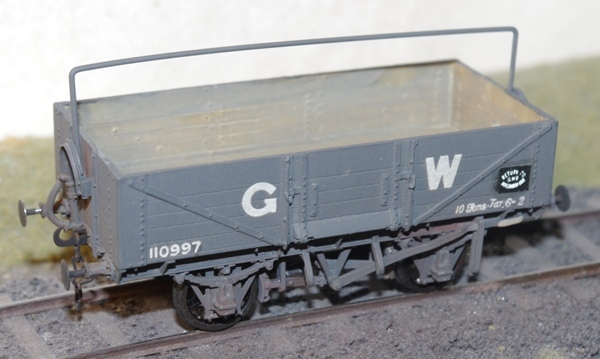 Very similar to the O11 above except that it does not have a sheet supporter, the diagonals on the sides had a flat foot and the buffers had laminated springs behind the buffer beam. 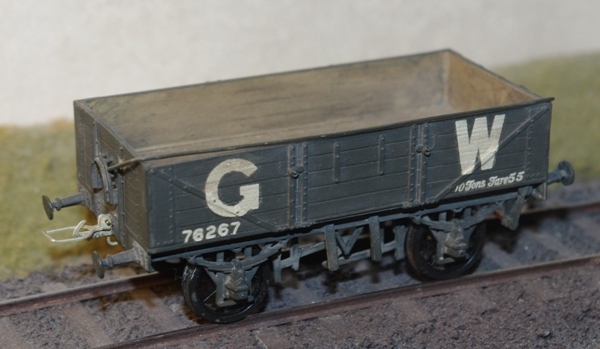 Although in Rhymney Railway livery this was a standard GWR design, it is an O18, modelled from an old Kirk kit. Also similar to the O11, it differed by having a tapered foot drop door. Most O18s had sheet supporters, but not those built for the Rhymney. An O20 from Kirk kit. This design was rated to carry 12 tons, whereas previous designs were only 10 tons. 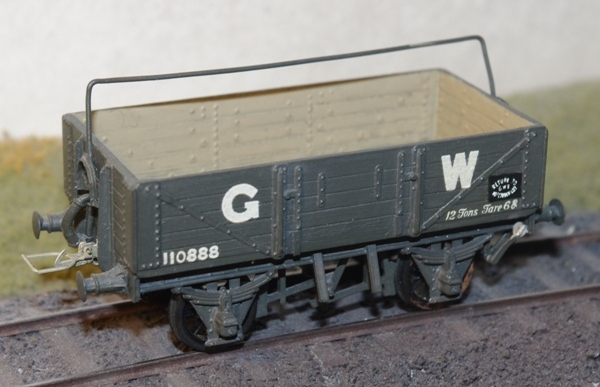 Like the O11 it has DC III brake gear, a sheet supporter, flat drop door and GW self contained buffers. But it also had vacuum brakes. An O23 from a Kirk kit. This was a 12 ton version of the O18 and none had a sheet supporter. 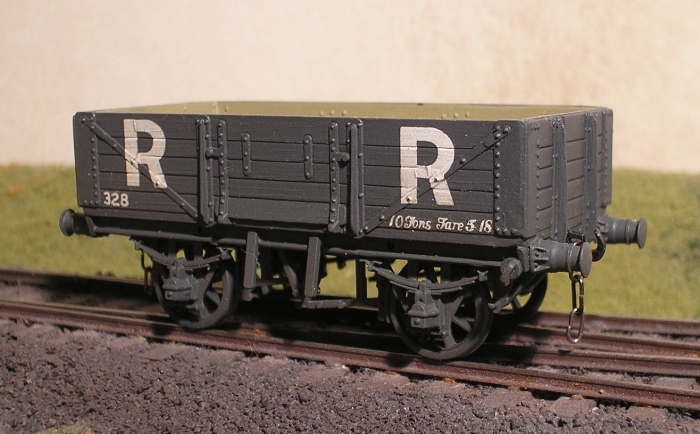 But the main difference was that the brake gear was changed to Morton brakes with brake blocks only on one wide of the wagon. 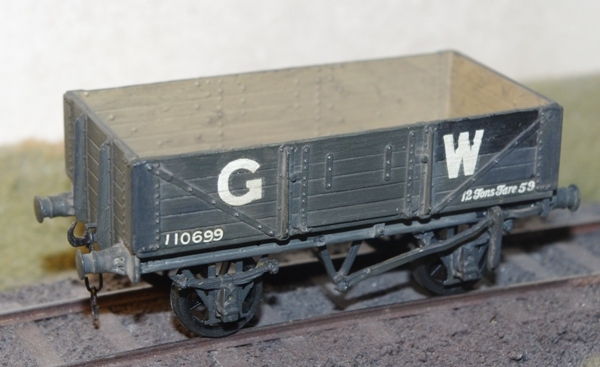 The first 17'6" long design with only a 9' wheelbase. An O24 from an ABS kit. 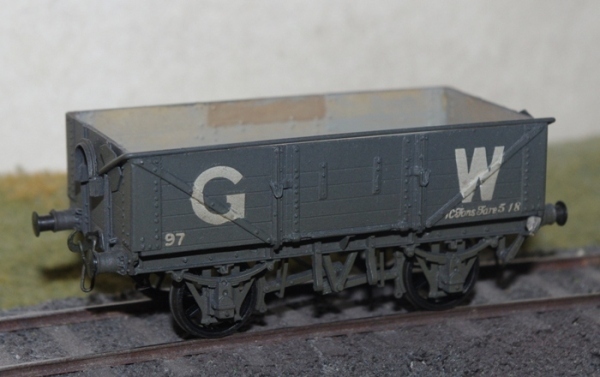 The axle boxes and buffers were RCH standard rather than GWR designs. Spot the difference! An O26 from an ABS kit. Apparently the same as the O24 but only 10 ton load! An O26 with a sheet rail and vacuum fitted makes this is an O36. Again from an ABS kit.